As my new year gift, I got a brand new Samsung Galaxy Note 5. One of the features that I really look forward to try out is the new Samsung Pay, which only available in the newest Samsung phones: Galaxy S6, S6 Edge, S6 Edge+, S6 Active and Note 5. I have been using the Apple Pay on my iPhone 6 plus for a while, one thing that frustrates me is that it needs the NFC terminal in the store. While many of the local store in US are still using the old magnetic technology on the terminal. Even the big box groceries such as Tom Thumb and Kroger near my house haven’t upgraded to the NFC yet. The Samsung Pay, however, is capable of using the magnetic coil build in the phone (which is also used for the wireless charging) to emulate the credit card swipe signal. It is a genius idea! So instead of swiping the card on the terminal (it will create a data time sequence in the magnetic reader head), you just put the phone close to the reader head, the phone create the time sequence for you. With this and the build in NFC, Samsung Pay can literally work on any credit card terminal. There are some exceptions such as ATM machine and gas station. The reason is that in those terminals the card insertion physical activity is actually used to trigger the read. I have an idea such that if you insert a plastic card (without magnetic stripe) and then click the pay button, it might be able to make it work. I haven’t test it out though. In the Apple Pay website, they list the places (store) that accept the Apple Pay. They are adding store by store. In Samsung Pay website, they list the banks that support the Samsung Pay. They are adding bank by bank. You might have noticed that as the initial roll out, several major banks such as Amex, BoA, Citi, Chase, already started supporting the Samsung Pay. I am sure more banks will jump on as time moves on. There is another small logo you might overlook, which is the Synchrony financial. In case you don’t know, it is the name behind many of the Store Credit Cards that you are using. It is good. Getting started with Samsung Pay is pretty straightforward. You download the Samsung Pay Apps from “Google Play Store”, sign in with you Samsung Account and add credit card. It is ready to use. The first step to download from Google Play Store is important. Some of my friend had problem with clicking on the existing “Samsung Pay” icon and the installation was never finished from there (maybe access issue in Android). 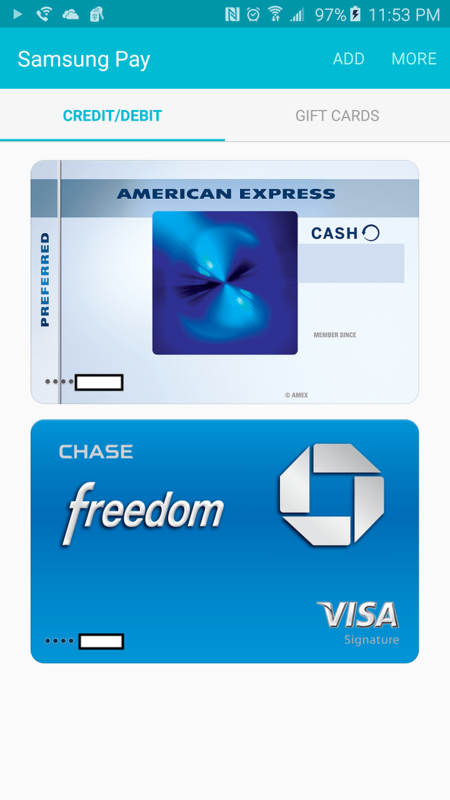 One minor issue that I experienced is with my American Airline Platinum Card with Citi bank. Even though the Citi bank was listed as supported but somehow I could never add it in the Samsung Pay program. Other cards are fine. I tried using the Samsung Pay in several different occasions, grocery shopping, restaurant, in-store return, etc. All works great. I could remove most of my credit card from my wallet from now on.